If you’ve been reading my blog, and I hope that you have, you’ve probably noticed that I’m surprised by a lot of the gadgets that I review. Who would have thought that there was such a thing as a toe separator? Okay, let’s get to it. My ZenToze Toe Separators by Lemon Hero arrived and I slipped them on to my tired feet. I found them to be super comfortable to wear, as they’re made of flexible silicone gel, and I took a little “me” time to relax. The toe separators alleviated the aches in my feet! I actually have an aqua-jet foot spa, but it’s aggravating to take it out, fill it with water and empty it when I’m done. These just slip onto my toes and comfort is on its way. 1. Do your feet hurt by the end of the day? For too many of us, aching feet are the price we pay for years of walking and standing! You may stretch your leg muscles, but do you ever stretch your feet? 2. Prolonged foot strain causes tightening of muscles and ligaments, shifting the foot and toes out of position. Even slight changes in foot alignment will change the way you walk in ways that can lead to hip or back problems. 3. Medical authorities like the National Institute of Health recommend exercising your feet to improve circulation as part of regular foot care. You may find that a toe stretcher helps tremendously. 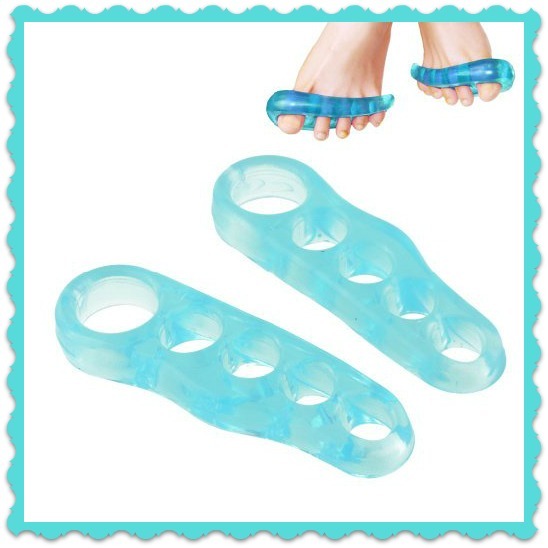 ZenToze Toe Separators by Lemon Hero list for $21.99, but are available for $11.99 on Amazon! MEDICAL DISCALIMER: This product is not a substitute for medical care. Always seek professional medical advice for the diagnosis and treatment of pain, injury, or irritation.